14 Day Tag-a-Long Package -"Kimberley & Top End"
This package is a Guided self drive tour. The following itinerary is designed to take you safely to the main attractions of the Kimberley and Top End. You will be travelling in your own vehicle with a group of other like minded travellers. The tour will be led by an experienced guide who will be driving their own lead vehicle with all the necessary experience and equipment to ensure your safety. This package offers the Ultimate Kimberley & Top End Experience. This package allows you to explore the Kimberley in the safety and comfort of your own hire vehicle. You drive your own 4WD with a professional and licenced guide in a lead vehicle. The group is limited to a maximum of 8 following vehicles. Your guide is professional and knowledgeable and you will explore and stay in stunning wilderness areas camping or upgrade to purpose built safari tents and luxury accommodation. 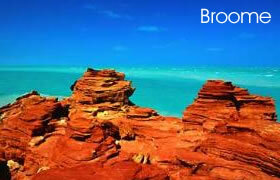 Choice of "Camping Package" or "Bed & Meals Package"
Arrive in Broome & pickup your vehicle from the depot. 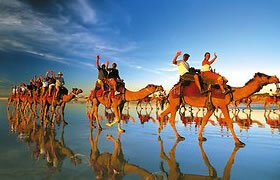 The group will meet up at 1.30pm with their vehicles at Cable Beach. You will be welcomed by your guide where you will be given a debrief of the tour and the chance to meet your fellow travellers. Depart Windjana Gorge and back onto the Gibb River Road as the group is guided into Bell Gorge for Lunch. Bell Gorge is located within the stunning King Leopold Range National Park and is one of the must see gorges in the Kimberley. You will have ample time to swim, take photographs and bushwalk. After lunch its off to Charnley River Station where you will have time to begin exploring this 750,000 acre working cattle Station. You will meet station owners Peter and Cheryl Camp where you will get an insight into remote country living and get to meet the stockmen, jackaroos and jillaroos who work on the station. A full day to relax and explore this magnificent part of the Kimberley. You will spend the day exploring the gorges & waterfalls on the property. Opportunities abound to enjoy swimming, fishing, canoeing and wildlife and birdlfe. With exclusive access areas you will enjoy a truely exceptional and authentic day in the heart of the Kimberley without the crowds . The roads in the property are well maintained and the attractions easy to find so you can join the group or travel independently today. Day 5 the group departs Charnley Station and heads to Mnt Elizabeth along the Gibb River Road. A relaxing day visiting more of the stunning attractions along the way. You will visit, relax and swim at Galvans Gorge, Manning Gorge & Adcock Gorge. The group will arrive into Mnt Elizabeth Station mid afternoon where you can relax, unwind and experience true outback hospitality and another one of the Kimberley's great cattle stations. Day 6: Mnt Elizabeth to El Questro. Day 6 say goodbye to Peter and Pat Lacy at Mount Elizabeth Station and head down the Gibb River Road into El Questro the world famous 1 million acres cattle station that has been made into a wilderness park. The section of road between Mount Elizabeth and El Questro offers excellent scenery and offers some challenge and adventure as you cross the mighty Pentecost River. At El Questro you will have an opportunity to check into your accommodation or campsite. A free afternoon to enjoy the spectacular scenery, bushwalk or fish. A full day to relax and explore the awesome attractions and things to do at El Questro Station. There are all sorts of station activities including flights, heli-fishing, gorge cruises, horseback, camel-riding, and bushwalks. You will be given a tour of El Questro Gorge - the most spectacular walk in the park making its way through narrow and shear cliff faces, clear rock pools and tropical rainforest. The group will also take in Zebedee Springs - a must do attraction. You will then have a free afternoon to stay with the guide and visit some other great spots or travel independently doing a Chamberlain Gorge Cruise or visit Emma Gorge to name just two. Day 8: El Questro to Kununurra. A free day to relax and/or explore the stunning attractions around Kununurra at your own pace. Depending on your interests choose between a number of world class attractions including Lake Argyle & the Ord River or the spectacular scenery and bushwalks of Keep River National Park. Alternatively choose a guided tour into the Mitchell Falls, Bungle Bungles or the Argyle Diamond Mine. (all spectacular options - please note extra Cost). Day 11 the group will drive out and spend the morning at Katherine Gorge to visit and explore this spectacular tourist attraction by foot or alternatively you can take an optional 2 hr cruise, heli flight or hire a canoe (all extra cost). 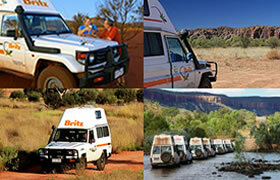 After exploring Katherine Gorge the group will hop back into their vehicles and you will make the journey to Kakadu. Along the way your guide will stop over at historic Pine Creek. On arrival into Kakadu your guide will take you to the spectacular escarpment country in the south of the park including a refreshing swim at Gunlom Plunge Pool. After some time in the southern region of Kakadu you will be guided to your accommodation in Cooinda where you will have the opportunity to check into your accommodation or your campsite. Late afternoon uou are free to visit the Culture Centre relax by the pool or take on a sunset Yellow Waters Cruise (extra cost). Day 12 is a full day exploring the central and northern sections of Kakadu National Park. Your guide will take you through all the key attractions that have made Kakadu internationally famous. After exploring attractions such as the Bowali Visitors Centre & Nourlangie Rock you will arrive into the township of Jabiru for lunch and be given the chance to check into your accommodation or campsite. In the afternoon the group will drive out to Ubirr to explore the famous rock art & take the opportunity to watch the incredible sunset over the Wetlands. (Absolute Must Do) The bushwalks in this area are some of the best short walks in the park. After sunset on Ubirr Rock you will return to your accommodation in Jabiru. Day 13 the group will leave Kakadu National Park and head to Litchfield National Park along the Arnhem Hwy, stopping at Fogg Conservation Reserve & Window on the Wetlands Visitors Centre along the way. On arrival into Litchfield you will instantly exploring and enjoying the magnificent waterfalls and swimming holes of this popular National Park. Cool off with a swim at Buley Rockhole & Wangi Falls and explore towering magnetic and cathedral anthills. You will have ample opportunity to check into your accommodation or campsite.Late afternoon the group will meet for the last night of the tour together with a BBQ Dinner. The group will spend the morning driving the 140km back to Darwin to return your vehicle and depart Darwin. Depending on what time you are departing Darwin you have the option to explore some of Darwins attractions. Alternatively if you are enjoying the magnificent waterfalls and swimming holes of Litchfield National Park.Feel free to revisit the attractions in the park and return to Darwin later in the day on your own. Package price is based on vehicle being returned to the depot before 4pm. **Package Upgrade: Include Prepaid Fuel: - Extra Cost! Prepaid Fuel!! - Include a multi-site fuel card with $400 worth of discounted fuel. This multi-site card can be used at any service station and offers a guaranteed 10% discount on pump price. (For Example If fuel is $1.50/L you save 15c per Litre) Discount applies on top of any other advertised specials. 2 nights accommodation Mangrove Quality Suites Apartments fully self contained apartment. 1 night Safari Tent with linen provided. facilities include nearby dining room showers & toilets. 2 night Safari Tent with double bed linen provided. Facilities include nearby showers & toilets. 1 night Kakadu National Park accomodation at the Croc Hotel with ensuite & pool. 1 night standard room at Batchelor Resort at Litchfield with ensuite & pool. 1 nights Katherine Deluxe Room with ensuite, pool, bar and restaurant . For tours starting in Darwin - 1 nights accommodation in a 1 Bedroom waterview at Cullen Bay Serviced Apartments with ensuite & pool. all inclusive with, Unlimited Kilometers, GST, Kitchen Kit , Linen, table and chairs, Insurance included $0 Excess, extra drivers fee, stamp duty and admin fee, 4WD outback Safety Kit, pre-purchase gas, one way fee, Broome remote fee - drive away nothing to pay. Traveller to organise his/her own flights to & from Broome. All Drivers must be over 21 and have a valid drivers licence. I have some Questions or Changes! Can I book through a Travel Agent?